Locals who make the pledge to wear a seatbelt, could win a resort getaway from the William Mattar April contest. For the month of April, it is once again time for the William Mattar Buckle Your Belt Contest where a greater Buffalo, Rochester or Syracuse local could win a family vacation. Simply by pledging to always wear a seatbelt when in a motor vehicle, one lucky winner will receive a trip for 4 to Fern resort in Ontario, Canada to enjoy lots of fun activities, relaxing scenery and create lasting memories with their family. To enter go to WilliamMattar.com. Because seatbelt safety is so important to William Mattar law offices, the firm is looking for help to spread the word on social media for the community. 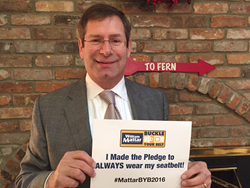 Just print out the #MattarBYB2016 sign from their website, snap a family photo taking the pledge, and then share it on the William Mattar law offices Facebook, Instagram, or Twitter page. William Mattar has represented those injured in motor vehicle accidents since 1990. The firm is actively involved in community events and has established a number of programs and initiatives such as the Safe & Sober Free Ride Home Program on New Year’s Eve, the Carbon Monoxide Detector Giveaway and Pencils 4 Schools Campaign. Learn more about the firm’s community involvement, and how you can participate, by visiting WilliamMattar.com.